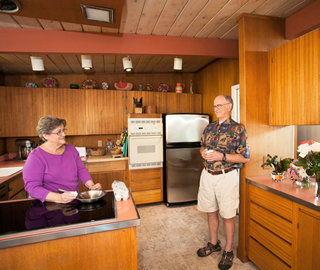 Karen and Steve Maskel hang out in the original-looking kitchen in their Sunset Terrace home. The Maskels' carport and fence of their home face the street (middle above). Beyond the fence lies a lovely hidden courtyard (above), a design characteristic typical of Mogensen's Sunset Terrace models. He also created an animated film based on Hans Christian Andersen's The Steadfast Tin Soldier that proved popular, and moved to California shortly after World War II hoping to work for Walt Disney, Tom says. "That was always the rumor," Tom says, noting that neither his dad nor his mother talked much about the past. 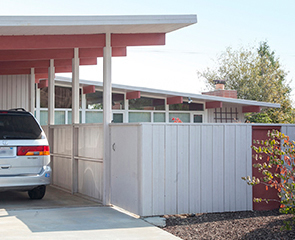 Instead, Mogensen found himself in the Bay Area, working for the leading modernist firm Wurster, Bernardi & Emmons before going on his own in the late 1940s. "He was rather quiet spoken but charming. An attractive guy," recalls T. Jack Foster, Jr., who, with his father, T. Jack Foster, and brothers, developed Foster City in the 1960s and '70s. Mogensen and his wife, Cecelia, who had married in Denmark, their son says, were "very Danish," recalls Shirley Taylor, who met them when she bought one of his homes in Sunset Terrace in 1955. "Both my parents were elegant Europeans," Tom says, playing up their European background for both professional and social effect. Each spoke several languages. "They were there at the perfect time to be Danish," Tom says, noting the popularity of Danish modern design. For a time his father even built and sold wooden furniture, working with a fellow Dane who was a woodworker. "My friends referred to my dad as the 'King of Denmark' because of his stature and the way he handled himself." Though far from Bohemian, Mogensen enjoyed parties, Tom says, and was good friends with Bay Area artist Beniamino Bufano. Hillsdale Mall is filled with Bufano sculptures because Mogensen introduced the artist to Bohannon, Tom says. And Mogensen designed an art studio for Bufano on the site of the mall. Tom remembers a father with an ultra-dry sense of humor, who was a good swimmer, tennis player, and horsemen, and a very good painter of landscapes and figures. Cecelia, a landscape architect who ran her own practice and often worked on projects with her husband, was equally athletic and a beauty. "My mother smoked," he says, "but only at parties, and when she smoked she did the best Marlene Dietrich you ever saw." The Mogensens were prosperous, too. Mogensen began his sojourn in the United States with the help of a great uncle and aunt who ran a successful dairy near San Luis Obispo, Tom says. By the mid-1950s the family was living on seven acres in Woodside, where Mogensen designed and built a house and a stable for four horses. 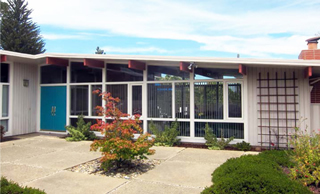 Although Mogensen worked in more than one mode, including International Style glass box for some apartments, he had a definable look all his own, with characteristic detailing, and an interest in warmth, subtle color, texture, and light that can be seen in many of his works, from apartments and offices to homes. Mogensen added textural and formal interest to walls, windows, and other surfaces by breaking them into a series of rectangular, rhythmic, and often asymmetric patterns of varied texture or color, or by setting one area off by framing it with wooden slats or mullions. This framing device can be seen in Mogensen's homes in fireplace surrounds and in frames around windows and doors. He used frames as well in apartment buildings. Interiors of his Skyline Terrace apartments in Burlingame are enlivened by front door frames that take in both the door and side panels. Sections of tile work and vertical wooden slats on the walls add visual interest. "A lot of the surface is broken up," Tom Mogensen observed on a recent tour.